Nishi Shuzo's single-minded dedication in drawing out the maximum potential of white koji gave birth to Hakutake Hozan. 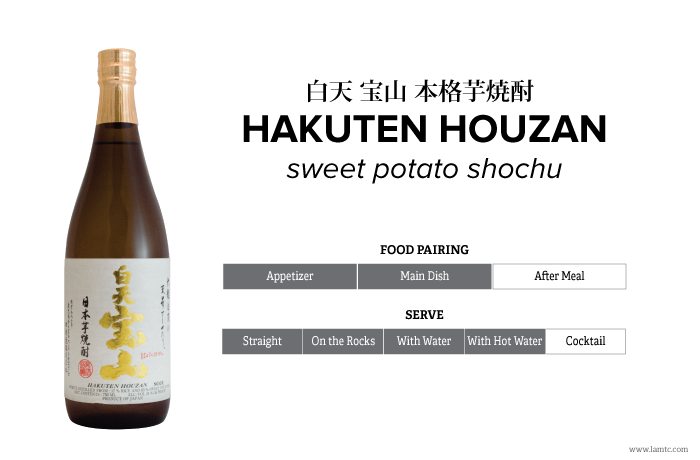 This Shochu offers approachable plump aroma of potatoes with luscious mellow sweetness while still finishing sharp. As with most sweet potato Shochu, best to drink as oyuwari or with hot water to bring out the best qualities of the Shochu. Another recommended way to enjoy this Shochu is side-by-side tasting with Tomino Hozan (crafted using yellow koji) and Kiccho Hozan (crafted using black koji) to taste the differences in flavor profiles.